We at Transformations care about our environment and our products reflect that. Below is a summary of the environmental benefits of our construction. Transformations endeavors to provide products that deliver unprecedented Function, Sustainability & Design. To that end, all our styles are engineered with a lifecycle 3 to 5 times longer than disposable seating alternatives. When a Transformations product becomes damaged or worn, the damaged part and/or fabric can be replaced, rather than the entire piece taking up space in a landfill. The renewable aspect of our furniture dramatically reduces the amount of foam, chemicals and trees being used, as well as the unnecessary spending of fuel, energy and labor to manufacture, ship and install new products. All chipboard in our products is 100% recycled material. Blanket-wrapped is the preferred method of shipment to reduce packing waste. 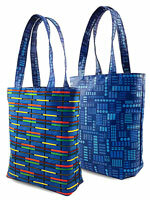 We even reuse fabric scraps to make colorful bags! We’re always looking for ways to conserve our valuable resources. Do you have an idea that may help?